Note: This item will be shipped UPS Ground or truck only due to Aerosol/Liquid shipping restrictions. Order this item when you can be assured the temperature is above freezing. Alaska/Hawaii only - a surcharge will apply for this item because of the distance and liquid/aerosol contents. Website price $59.99 for the KIT with FREE Shipping! NEED HELP? Check out our Wax Guide or Table Shuffleboard Care Tips! Triple Crown Liquid Wax - Provides a protective coating to your table for a smooth fast finish. It also prevents dry or dead spots. Look at your table care page for board care tips! One Quart Bottle. Note: This item will be shipped UPS Ground or Truck due to Aerosol/Liquid shipping restrictions. Order this item when you can be assured the temperature is above freezing. Alaska/Hawaii only - a surcharge will apply for this item because of the distance and liquid/aerosol contents. Website price $25.99 with FREE Shipping! Website price $66.75 for case of 4 quart bottles with FREE Shipping! 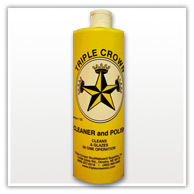 Triple Crown Glaze & Cleaner - Removes dirt and grime. Leaves a fresh, clean glaze for a smooth fast finish. One Quart Bottle. Shuffleboard - Provides a base after the liquid wax has dried, and before you use your favorite powdered wax. 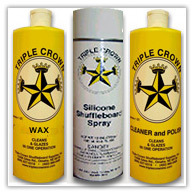 Triple Crown is formulated for Shuffleboard games. A small spray provides a consistent base - saves on the use of powder! Also safe on Foosball and Stick Hockey Tables! If you order this item, your order will be shipped UPS Ground or Truck due to Aerosol/Liquid shipping restrictions. Alaska/Hawaii only - a surcharge will apply for this item because of the distance and liquid/aerosol contents. Website price $109.00 for case of 12 with FREE Shipping!